Brief Synopsis – A Jewish New York businessman haunted by the war believes that he is being stalked by the former Nazi who tormented him while he was in a death camp. My Take on it – This is a film that is best watched with as little information as possible so that one can try to absorb it all in the way it was meant. They definitely take us on an interesting journey into the psyche of a man who was tortured and tormented for years at the hands of an enemy. The dialogue in this film (which is based on a play) is quite good and despite some lulls in the story, the speeches by the characters are done extremely well. Yes, there are a few scenes where the characters really go off on wild tangents of dialogue, but the dialogue feels so crisp, it matters not. The clues that they leave for us along the way are fun to try and spot, but one must really be paying attention to catch them. 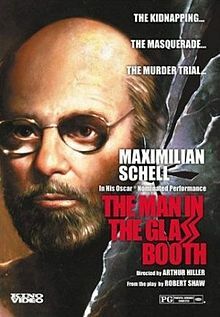 Maximillian Schell is quite good here, even if his character is slightly mad (which is obviously on purpose). Unfortunately tho, in the end, the story isn’t as captivating as one would expect and there are scenes that are outright boring to have to sit through. Bottom Line – Interesting journey into the psyche of someone who went thru so much torture at the hands of an enemy. The dialogue is quite good and keeps things interesting most of the way thru even when the characters go off on diatribes . I loved how there were a few nice obscure clues left along the way, but you really have to pay attention to catch some of them. Schell is very good here, but his performance does border on madness (which is part of the purpose). The story isn’t as captivating as it could have been and in some instances lulls into boredom. I liked this one more than you did. I certainly didn’t experience any moments of boredom! One of the interesting facts about the film is that it was based on a novel by Robert Shaw, the writer and actor (best known for playing Quint in Jaws). Shaw didn’t like the screenplay for the film and asked for his name to be removed from the credits, but when he saw the film pre-release he liked it so much that he asked for his name to be reinstated. Unfortunately, it was too late so he went uncredited.